This shot was taken in the early afternoon in April 2012. The location was at a usually busy intersection on Rockville Pike in Rockville Maryland. The "Take It!" came from my finally having come to the head of the column of backed up traffic at the intersection where the incident had its final moments. Just comprehending what I was looking at took me a moment to accomplish enough to grab my camera and take this quick shot. As you can see, the light at the intersection had just turned green and I could almost feel the duplication of all those behind me of how I felt when I was back there in the same position they were in. Sort of lets get moving with lots of emphasis. The After Take: I am going to combine some of the "Take" into this as somehow needed to get us moving from the snap shot of what had happened as did not want to replay the possiblity of us hearing the horns of those behind us for the delay in puting together an explanation of what I believe happened. Hope you do not mind the departure from the usual format. 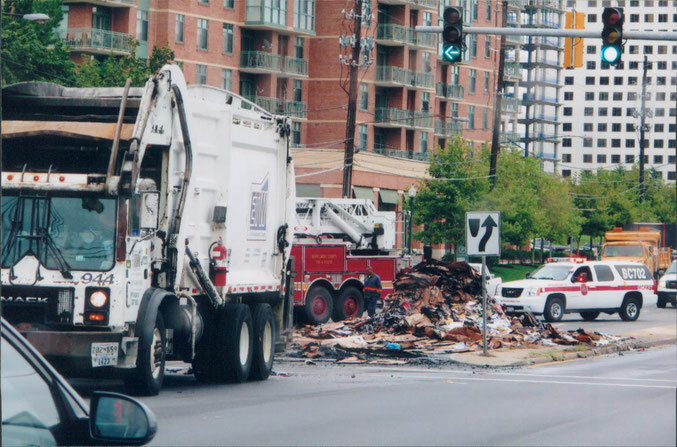 Returning to the scene: It looks like the driver of the garbage truck realized he had a fire in the load that was in the business end off his truck. Rather than let it progress any further, he took the great reaction to go ahead and dump the load thus ridding himself of the disaster. I can only imagine how they were able to avoid dumping it on any cars that might have been behind them. Talk about a potential "What in the world is going on!" for the car immediately behind them when they decided to dump the load right there. Well as we can see that possible additonal disaster did not happen. The fire department was called and the fire put out by the time we arrived to take this freeze framing of what could have been a catastrophy. It has taken me a while, but I have come to have an enormous respect for the drivers of these huge dump trucks that ply our streets and alleys. The driving skill these operators have is often a marvel to watch. They almost seem to become an extension of the vehicle itself. The many manevers they have to make, many times in impossibly tight quarters is a testiment to their depth perception and reflexes. Often we think of them as a nusance as they stop or do some sort of back up thing that holds us up in traffic for a moment. I think most are quite aware of what they are doing and make the move as quickly as they can safely accomplish it. I have only witnessed one garbage strike which was settled quickly as all realized the importance of not letting such a mess continue. I do not know if there is a quick thinking award available out there, but if there is, the driver of this truck would be my nominee for the year. If perchance the driver is viewing this photo and my modest attempt to describe it; Congratulations and thanks for your great reaction to the circumstance. Thanks for joining us for the current photo presentation. You are cordially invited to return Tuesday, August 21st for a new picture that we hope you will enjoy. PS: It is amazing to me how a photo can bring back one to the scene of what was pictured. The reliving available is simply a marvel to me. Now that would be a site to see! This photo really makes me wonder what set off the fire. Did the driver maybe flip out a cigarette into the trash? Did someone else? Very strange. At least he now has one really interesting story he can tell to his friends. Bet the people in the apartments right there love the smell of burning garbage in the morning. I think you're supposed to wait until you get to the dump before burning the trash hahahaha.